We are proud to announce The Gin Foundry was awarded a Silver Medal and a score of 89 from Tastings.com. Full review of Europa below. 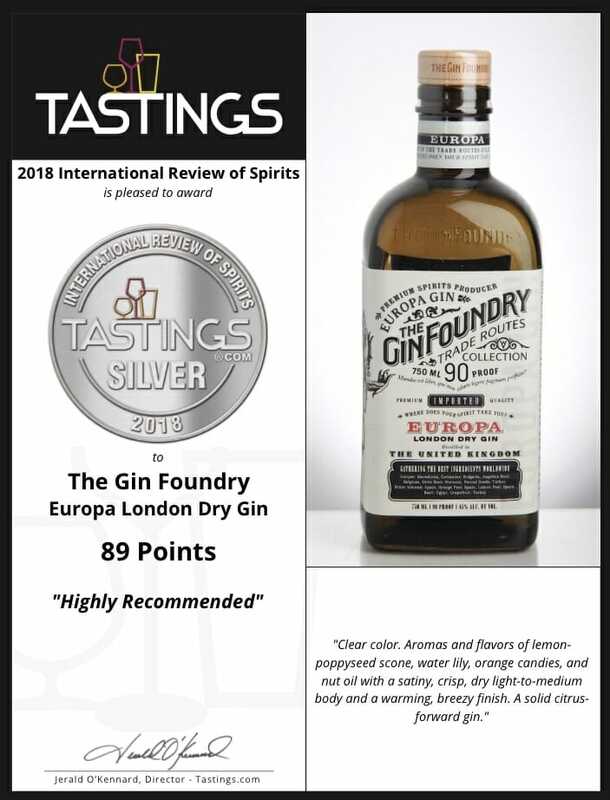 The Gin Foundry Europa London Dry Gin has been awarded a Silver Medal by The Tastings.com International Review of Spirits and a score of 89 points on a scale of 100. Tastings.com review of Europa puts it in the “Highly Recommend” category for gins. This award comes directly on the heels of receiving a Gold Medal at the World Gin Awards last month in London. Europa also received a Bronze Medal last night at the American Craft Spirits Association Craft Spirits Awards in Pittsburgh. Medals winners at the ACSA awards were hand-selected among a pool of more than 500 entrants. The Tastings.com International Review of Spirits is America’s oldest annual international spirits competition and has been operated objectively for 25 years. It is a blind tasting, medal-based competition that awards based on a 100-point scale. Spirits are judged by Tastings.com’s trained staff joined by top Spirits professionals and buyers from retailers and restaurants using a proven, consistent, proprietary methodology developed in collaboration with Cornell University. The Tastings.com International Review of Spirits distributes its monthly results to consumers and the trade through Tastings.com, a free consumer website with tens of thousands of unique users a month on its searchable databases and via social media @tastingsbti. https://premierinnovationsgroup.com/wp-content/uploads/2018/03/SilverTastings.jpg 922 703 Frank Bachurski https://premierinnovationsgroup.com/wp-content/uploads/2017/07/Group-1-300x300.png Frank Bachurski2018-03-08 20:54:312018-03-08 20:54:31The Gin Foundry Wins Again And Again! 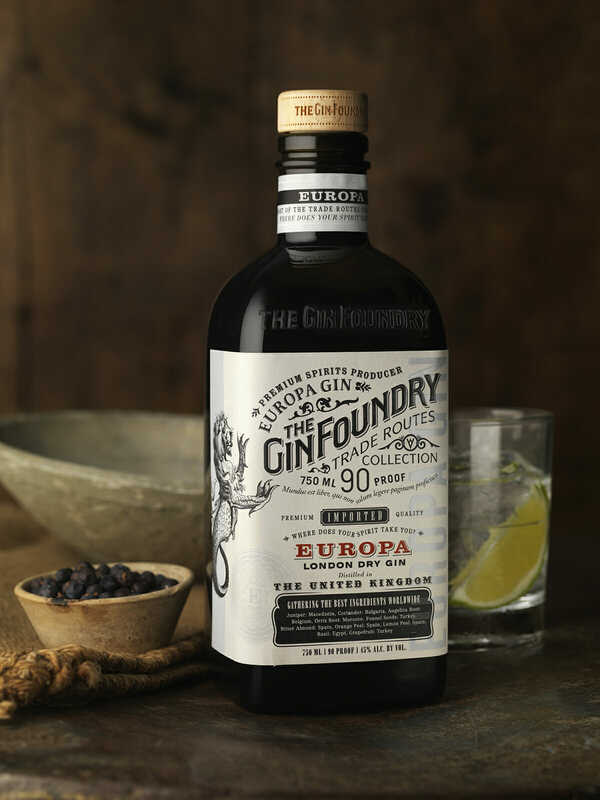 The Gin Foundry Europa Wins Gold Medal At World Gin Awards. 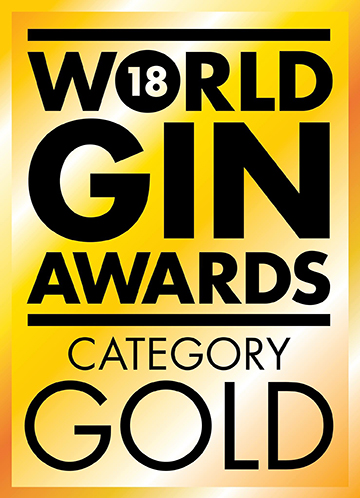 Premier Innovations Group is proud to announce that The Gin Foundry Europa London Dry Gin has been awarded a Gold Medal for Taste at the World Gin Awards in the London Dry Gin Category. The World Gin Awards are the global awards selecting the very best in all internationally recognized styles of gin. Presented by TheDrinksReport.com, the world’s No.1 online resource for drinks professionals, the World Gin Awards select, reward and promote the world’s best gins to consumers and trade across the globe. 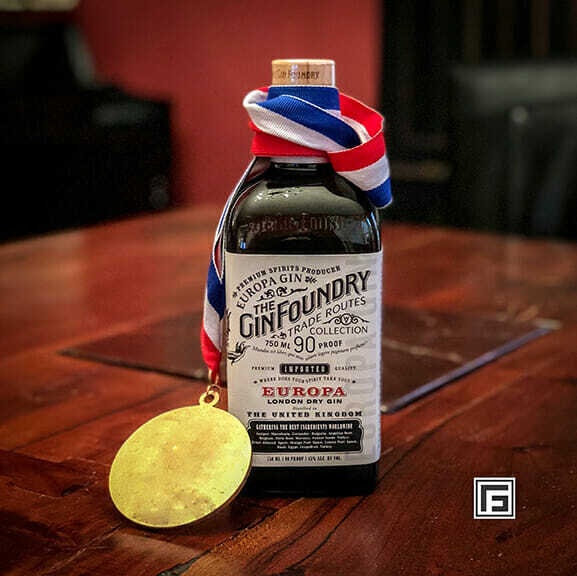 The Gin Foundry Europa went head to head against gin producers from all over the Globe and came away with a Gold. Premier Innovations Group played a key role in the creation of The Gin Foundry product and is responsible for securing the bottling facility, consulting of the gin formula, as well as the packaging components that make the vision a reality. Premier imports the product using the necessary federal importers license and permits and continues to work hand in hand with The Gin Foundry to grow awareness for the brand and expand into new territories. launching into other markets in the coming weeks. that creates a gin that plays well in a wide range of classic and innovative gin cocktails. 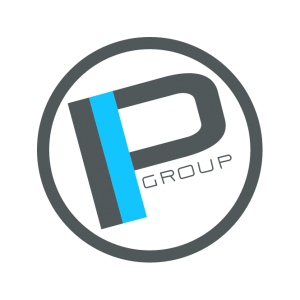 If wine and spirits are something that you are interested in pursuing, contact Premier Innovations Group today. We have the knowledge, resources and passion to make your vision a reality. And we have an award winning palate.